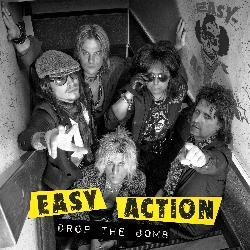 Easy Action: nuovo singolo “Drop the Bomb” | SLAM! I leggendari glamster svedesi EASY ACTION torneranno con un nuovo video e singolo del brano al titolo “Drop The Bomb” il prossimo 27 luglio! Questa primavera la band festeggerà il 10° anniversario della reunion show del 2006 allo Sweden Rock Festival, il frontman ZINNY ZAN (Shotgun Messiah, Zan Clan) e il chitarrista KEE MARCELLO (Europe, K2) torneranno a suonare insieme dopo 20 anni. …but with the new members SIMON ROXX (Ammotrack, Volume Unit), BJÖRN ”Grizzly” HÖGLUND (The Summit, Martina Edoff) and MICHAEL GRIMM (Supergroupies) we had so much fun, and sounded so good … that we decided to have a go at it. We wanted to close the book by at least releasing something from the would be album. If not for all the people who asked about the band .. then for Michael. Though I am sure that many of the songs we wrote will surface some way or another pretty soon.